In his talk with Fortune (s twx) writer Adam Lashinsky (video embedded below), Costolo noted that while Twitter took three years to get to one billion tweets, it now sees that many messages posted to the network every five days. He also said that there are more than 200 million registered users of the service (defining “active users” is difficult, if not impossible, he argued) and that third-party analytics show that the Twitter.com website gets more than 400 million unique visitors a month. 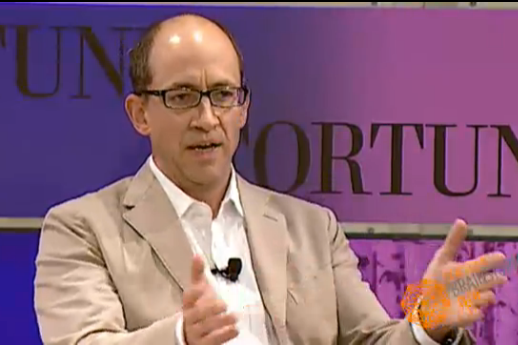 Costolo added that Twitter is seeing 40-percent growth every quarter in terms of mobile users. And what about Google+? Costolo said that while he believes Google “will leverage their tremendous reach to pull people into this experience,” he isn’t focused on competing with the service, but instead sees Twitter as “offering simplicity in a world of complexity.” The Twitter CEO also confirmed that the company will likely raise money soon to provide funds that it can put into building up its infrastructure (there have been rumors that it is raising a new round of venture financing that will value the company at $8 billion) but he wouldn’t say whether it will be a public offering or a private financing. Can Twitter manage to make the transformation from being a real-time information network to being a platform for real-time commerce? Costolo seems to be betting the company’s future — and his own — that it can. Amusing. The impossibility of defining ‘active user’ but handling ecommerce, no probs.